Posted by Marissa Russell on April 2, 2019 in Lifestyles, Top Stories. Ferris history junior and German Culture and Language Club Secretary Abbie Mumby meets with students every Wednesday to learn about another culture while making friends and playing games. 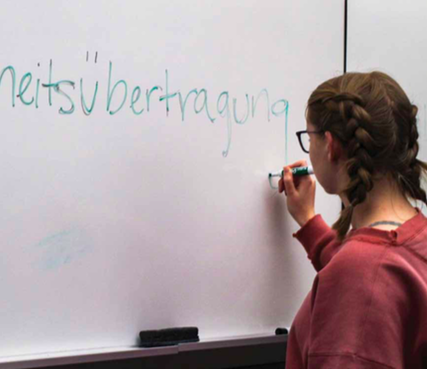 “We named this the German Culture and Language Club because it is both about the study of the German language and promoting that, but also learning about different culture, being exposed to a different atmosphere and global community,” Mumby said. At meetings, club members will engage in many German-themed activities ranging from music, movies and games such as German hangman, Sagaland, Camel Cup and Jeopardy. Though this is a club for members who are interested in the German language, members don’t want to exclude interested students. Subtitles are turned on during movie nights so that any non-fluent member can still enjoy and understand the movie. The German Culture and Language Club has about five to seven official members, but welcomes anyone who wants to stop in and learn more about the German culture without becoming an official member. Although the German Culture and Language Club doesn’t host any events on campus, they do take trips on occasion. According to Ferris history junior and German Culture and Language Club President Jason Mickevich, the club took a trip to Chicago in the fall of 2018 to visit Christkindlmarkt, a Christmas market meaning “Christ child market.” During their trip, members were able to see merchants selling traditional German food and drinks. Some foods sold were pretzels, gingerbread and Glühwein — a mulled wine popular in German-speaking countries around Christmastime that is typically spiced with cinnamon and cloves. The club is hoping to plan another trip to Frankenmuth later this semester. Due to budget cuts, German classes will no longer be offered at Ferris. This leaves the German Culture and Language Club’s status up in the air. The cuts have also affected political science and sociology as majors and minors on campus. Ollenquist said although Ferris isn’t offering German courses, students can take classes through other universities, in person or online, and have the credits transfer. Though German classes will be leaving Ferris, Ferris digital animation and game design junior Nicholas Salamone hopes the German Culture and Language Club will remain on campus. Salamone’s favorite part of the club is the relaxed atmosphere, and that everyone enjoys learning and trying to be a part of the German culture. The club is a place for any student who is interested in German culture to come and meet new people and experience something new. 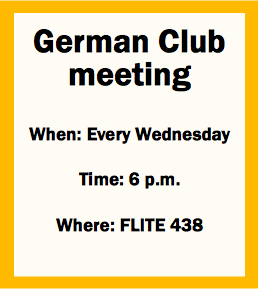 German Culture and Language Club meets 6 p.m. every Wednesday in FLITE 438. For more information, contact Mickevich at mickevj1@nullferris.edu.